As the UK transforms to an energy infrastructure based on electricity, with increasing reliance on renewable sources, the wider use of battery technology is anticipated. A range of domestic scale energy storage batteries is now available with the potential to reduce energy costs for households and ultimately contribute to the resilience of the grid. This introductory guide is for house builders considering the installation of a battery system. It highlights the practical and technical considerations when selecting a system and, in particular, how to ensure good alignment with the expectations of home buyers. 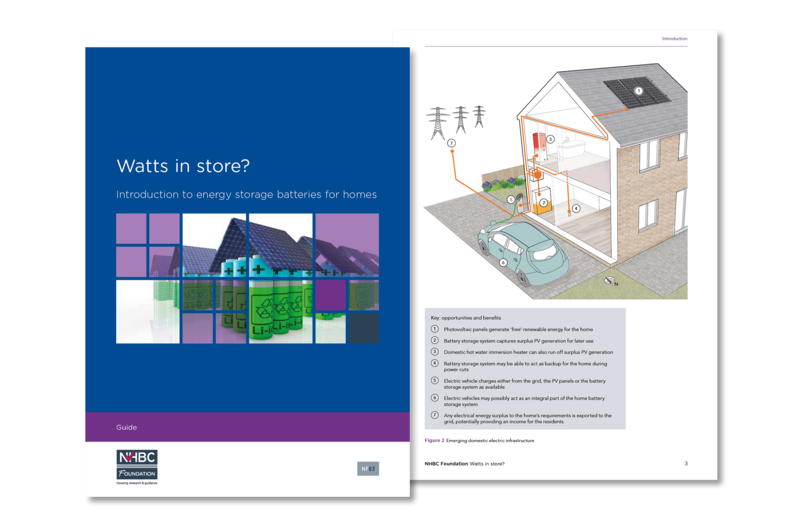 Using graphics, the guide introduces and clarifies the terminology used to describe the configurations of batteries in homes (including those coupled with photovoltaics) and their critical performance attributes. Introduction. Sets out the broad benefits of battery systems, both at infrastructure and household scale. It explains how a typical household battery system operates and how it could contribute to emerging domestic electric framework. What can batteries do (and not do)? Benefits of battery systems. For PV coupled systems, shows pattern of energy storage summer and winter, future of Feed-in tariffs. Discusses how a battery system can take advantage of Time-of-use (Time-of-day) tariffs. What home battery storage systems look like. Describes the general characteristics of battery systems, including appearance, weight and location, and how they are connected in the home (illustrates arrangements without PV and AC coupling/DC coupling with PVs). Technical considerations. Describes the importance of key performance attributes, including power, capacity, usable capacity, depth of discharge and power cut backup. Also touches on grid charging, round-trip efficiency, power cut backup, consumer units, safety, installation, commissioning and maintenance, lifetime and warranties, electric vehicles and Building Regulations Part L.
Industry standards and specifications. Briefly reviews the current industry standards, regulations and codes of practice related to battery installations. What’s on the horizon for energy storage? Introduces peer-to-peer trading, microgrids, V2G (Vehicle-to-grid), flow batteries, metal air batteries, supercapacitors, flywheels, CAES (compressed air energy storage), heat-based electrical energy storage systems, hydrogen.